Fourth round offers are out now. Offers will continue as positions become vacant. Third round offers are out now. Fourth round offers will commence on Thursday 27 September 2018. Second round offers are out now. 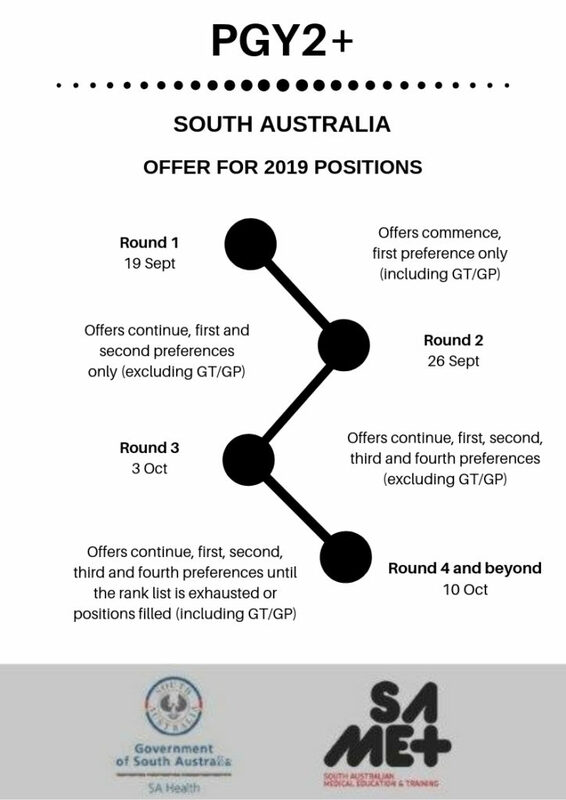 Third round offers will commence on Thursday 20 September 2018. First round offers are out now. Second Round offers will commence on Thursday 13 September 2018. Interview dates are now available on each programs job pack. View the PGY2+ Job Pack here. Access to SA Health’s eRecruitment system, PageUp, has been fully restored and the PGY2+ applications are now open (12 June 2018). PGY2+ applications will close on 4 July 2018. Start your application or read about job opportunities. There was a temporary suspension of access to the system, after PageUp reported a potential security breach impacting a number of companies and agencies across Australia. The temporary suspension delayed the opening of PGY2+ applications. As a precautionary measure, all users will be asked to change their PageUp password when they next log in to the system. For more information visit the PageUp Incident FAQs or email healthsamet@sa.gov.au. Due to unforeseen circumstances involving the SA Health’s eRecruitment job application platform, PGY2+ applications for 2019 positions were unable to open today (08/06/2018) as intended. Page Up (eRecruitment), the online system used for our recruitment process, has experienced a security incident which may involve a potential data breach. In order to protect all data, SA Health has temporarily suspended the use of Page Up and is placing its recruitment activities on hold until further notice. The Page Up portal will be closed for a minimum of one week while investigations are underway. PGY2+ applications will commence once Page Up is back online. SA MET will update you on the PGY2+ application open date as and when we receive further information. The application close date will be adjusted accordingly. If you have further queries on this matter, you can access the PageUp Incident FAQs. 2019 PGY2+ applicant information is now available on SA Health Careers or view the PGY2+ Job Pack. Applications for 2019 positions will open on Friday 8 June 2018 and close on Sunday 1 July 2018.